Lately we’ve seen a lot of unique photo Christmas cards that make use of an age-old technique: the use of antique props or weathered backgrounds to bring a nostalgic, vintage feel to a modern photo. It’s the juxtaposition of the old and the new, or the ugly and the beautiful that makes the photo interesting and draws your attention to the faces within. 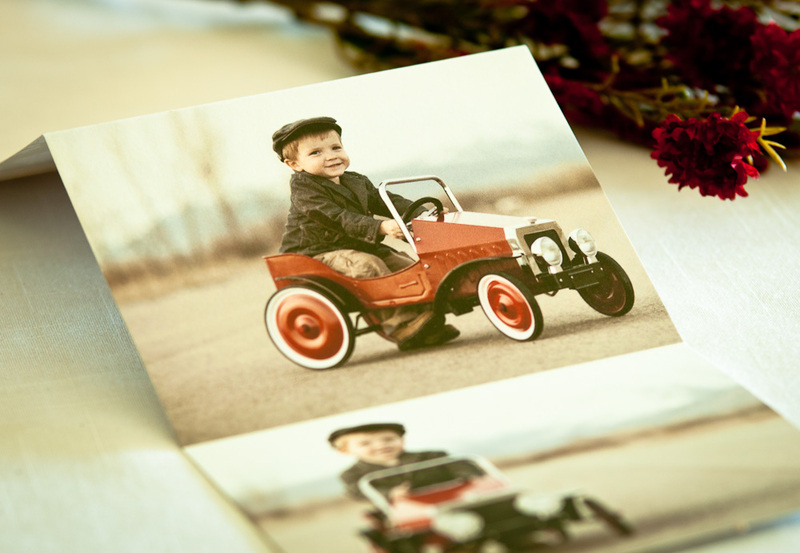 So how can you use these vintage photo ideas to make your holiday cards stand out? If you’re hiring a professional photographer, tell him or her about any vintage photo ideas you have in mind. They most likely have a selection of props and backdrops in their studio that can lend a vintage feel to your portrait. If you’re shooting on location, most photographers have plenty of pre-scouted locations they’ve used, and by letting them know you’re interested in a vintage feel, you’ll be helping them narrow down the options. If you’re taking the photo yourself, start by looking around your own house. Do you have an antique piece of furniture, picture frame, mirror, or old toy that would make a nice prop? Is there a wall or corner in your house with interesting woodwork? Outside, is there a weathered fence, or exterior wall with peeling paint or wood siding, perhaps? Remember, you don’t need to show all of it, just enough to give a vintage flavor. If you can’t find anything at home, expand your options. Explore industrial areas, looking for old signage, corrugated metal, stone and brick walls. Explore rural areas for bridges, barns, fences, warehouses, and train or gas stations. Perhaps grandma and grandpa have an old toy or bike of yours, stored in their attic? If your prop has sentimental value, all the better. Good luck on your hunt. We can’t wait to see the beautiful holiday photo cards our creative customers come up with this holiday season! And if you’re still undecided, read more family photo ideas on our blog.